This morning, After taking a bath, I sat on the sofa and applied Dermatix Ultra to my fresh scar. I was thinking, now is the perfect time to write about it and glorify God. My journey started last August 2013 when I had to undergo a D&C (Dilation and Curretage) procedure due to abnormal uterine bleeding (the bleeding had stopped after I had a D&C). A week after the procedure, I had a follow-up appointment to see my ob-gynecologist/gynecologic oncologist for the diagnosis. My doctor gave me the results from the pathologist - I had CIN3 with foci suspicious for microinvasion. To confirm this, she advised that I had to undergo a colposcopy (a magnified visual inspection of the cervix aided by using a dilute acetic acid solution to highlight abnormal cells on the surface of the cervix). Mickey and I knew that time was of the essence, we scheduled the colposcopy that same weekend. Before the colposcopy procedure, I was advised by my doctor that it would be best that Mickey would be also inside the room for moral support. Mickey was called in by the nurse to join us. He held my hand oftentimes stroking my hair to calm me during the procedure. A small camera was built in to the probe and projected images to a monitor. My doctor took a sample of the abnormal cells. Mickey and I went back after 4 days for the results and my doctor told me that I had cervical cancer stage 1A (microinvasive). It is cervical cancer at it's earliest stage. My doctor told me not to be scared, and be thankful that we found out about it at it's early stage. Microinvasive cancer stage 1A may be treated by doing TAH (Total Abdominal Hysterectomy or the removal of the cervix and the uterus). We didn't waste any time and scheduled for my TAH procedure in mid-September. On the day of my operation, before I was wheeled in to the operating room, I was looking at Mickey for reassurance. As if reading my mind, he smiled at me and told me "everything will be alright Tin, God is with you". That was all I needed to hear. After a 2-hour operation and 6 hours spent in the recovery room, I was wheeled back to my room. I can see Mickey waiting at the end of the hallway, smiling at me. He was a sight for sore eyes. I thank God for giving me a husband with such huge faith in God. He was my rock during this entire ordeal and I couldn't have made it through the emotional roller coaster that came with the diagnosis. 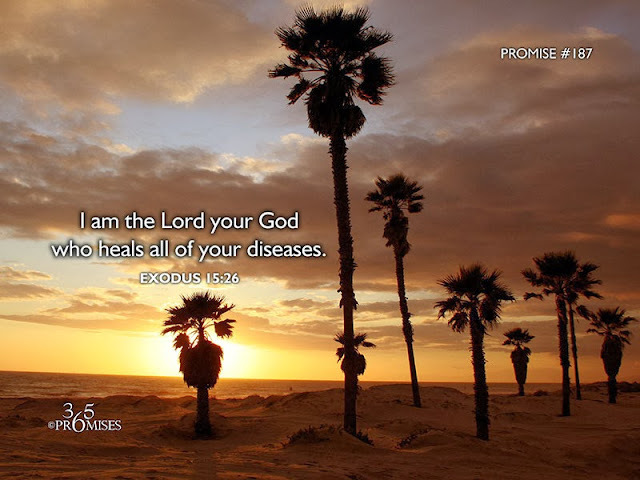 God was upholding us with his righteous hand during the entire ordeal and He has comforted us with his promises. We are thankful, grateful and blessed with the early diagnosis and now, God has defeated my cervical cancer. I am now cancer free! To God be the glory! Mickey and I would like to thank our families (and prayer groups), my bosses and friends for flooding heaven with prayers and for your relentless support. Thank you for dropping by to visit, for calling us, sending us messages to check if we were okay or if we needed anything, for sending food over for us and for sending flowers to make our day brighter while we were at the hospital. Mickey and I are blessed to have you all in our lives. Thank you Michelle C. for sending me the beautiful flower arrangement of pink flowers at the hospital. The flowers are lovely! I love looking at them everyday. Bambi, thank you for sending me the pink old navy shirt and the card that plays "I say a little prayer" by Dionne Warwick. I couldn't help but sing along each time I open it. Thank you CK for the sweet note at my desk and Mariel for sending me a letter and a card. On my last day at the office, before I was admitted at the hospital, I also had lunch with my good friend Len at Kai Greenbelt 5. We shared our life stories and she wears for me her only pink shirt during lunch. 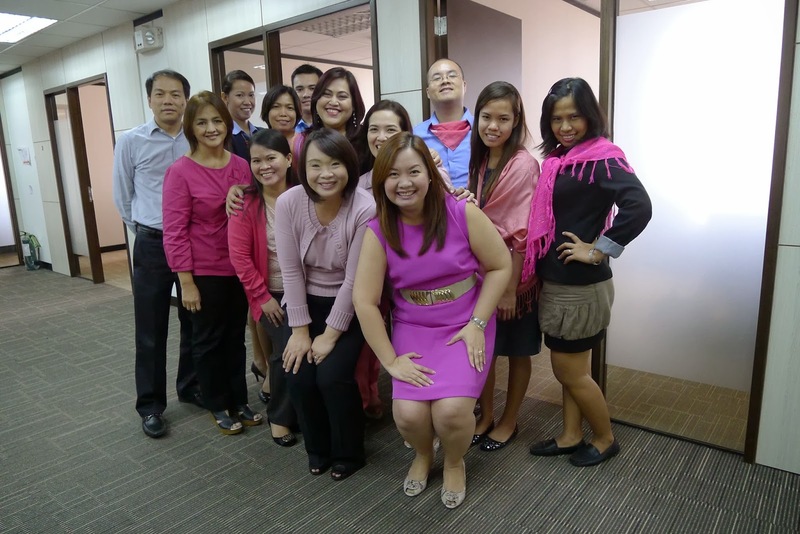 Thank you also to my friends Cindy, who is based in the USA, Marge, who is based in Canada, Rhia, who currently lives in Dagupan, Pangasinan and Bambi, who is vacationing in Hawaii, for wearing pink for me and sending me your beautiful photos. 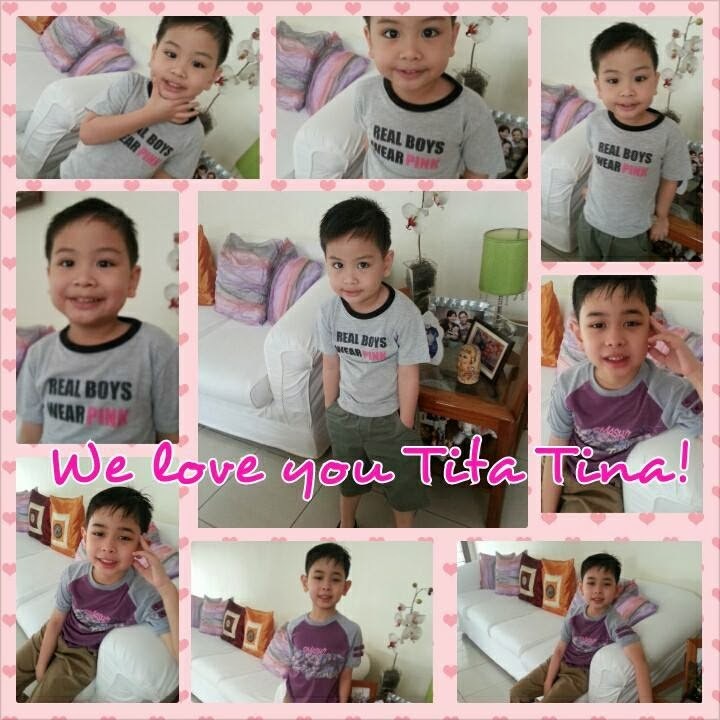 My friend Marilen's handsome boys Matteo and Joaquin wears pink for me. I love you Matt and Joaquin! 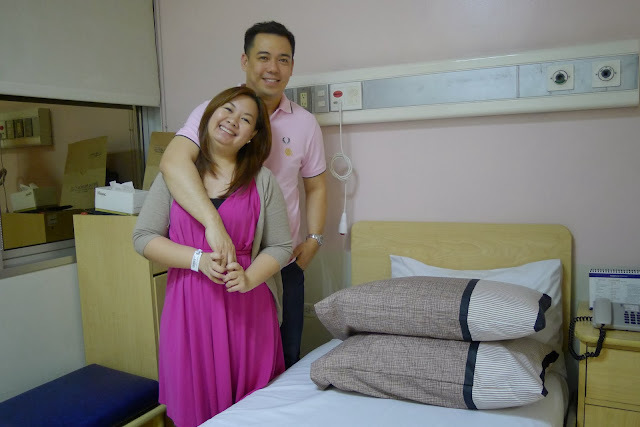 Mickey and I would also would like to thank my wonderful doctors at The Medical City. My ob-gynecologist/gynecologic oncologist, Dr. Edna Banta, my anesthesiologist Dr. Michael Joseph Reyes, Dr. Michaelangelo Sabas and Dr. Isaac David Esguerra II. 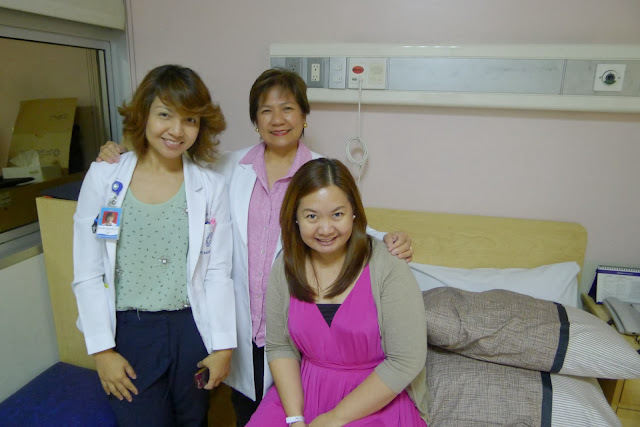 Not to forget the nurses at the 5th floor who took care of me during my 5-day stay. Thank you for taking care of me. God bless you all! I am sharing my journey here to give hope to women who may be diagnosed with cervical cancer. Please get yourselves screened yearly for cervical cancer through a pap smear because even if you had an HPV vaccine, remember that it is only effective if given before infection occurs. According to my doctor, the best age to get an HPV vaccine is at age 9, so if you have daughters who are at this age, please have them vaccinated. If you have a family member or a friend who is battling cervical cancer (or any type of cancer) for that matter. There is hope. God gave us his promise in His word. Hi Shar! Thank you! Hope to see you and catch up with you when you visit the gang at the office. Have a great week ahead! Hugs!